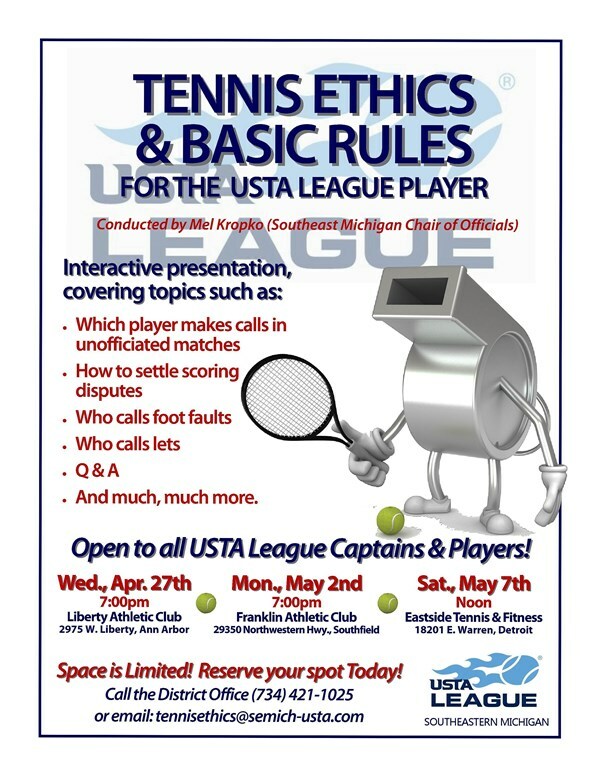 For the 2016 Summer League, the Southeast Michigan District is bringing back the Tennis Ethics and Basic Rules Seminar. These seminars were last held 2014, but due to continued interest, the seminars will be offered once again. The seminar is presented by Mel Kropko, the Southeast Michigan Chair of Officials, and all players and captains are welcome to attend. The topics covered will include; who makes calls in unofficiated matches, scoring disputes, foot faults, lets, and many more rules. Players can reserve a spot by contacting the District Office by email at tennisethics@semich-usta.com or calling (734) 421-1025.